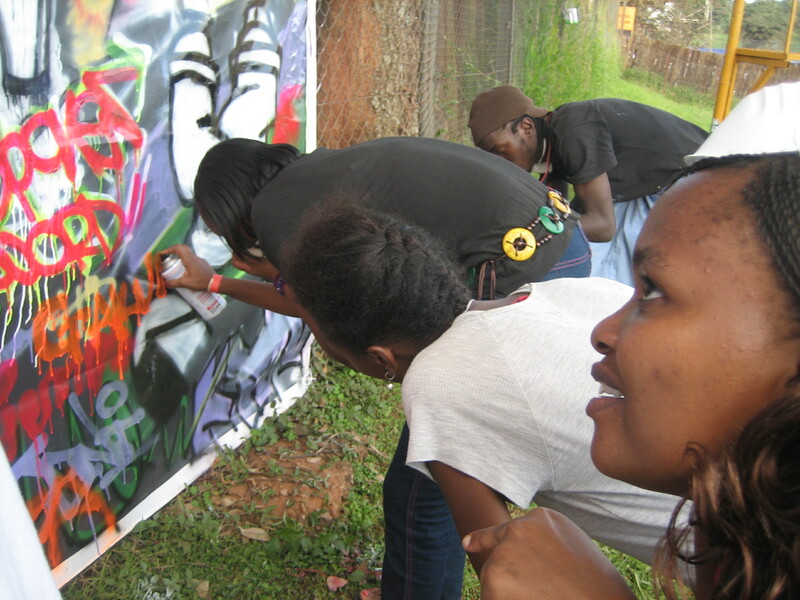 At this year’s This Is Uganda-festival young people shared ideas, promoted their artistic merchandise and learnt a thing or two about culture. Some came to see, some came to feel, other came to show off. 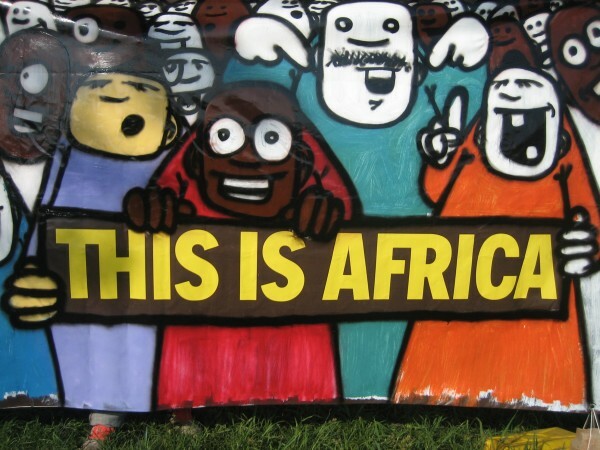 There were simple art project with global consequences, but was there a real message? 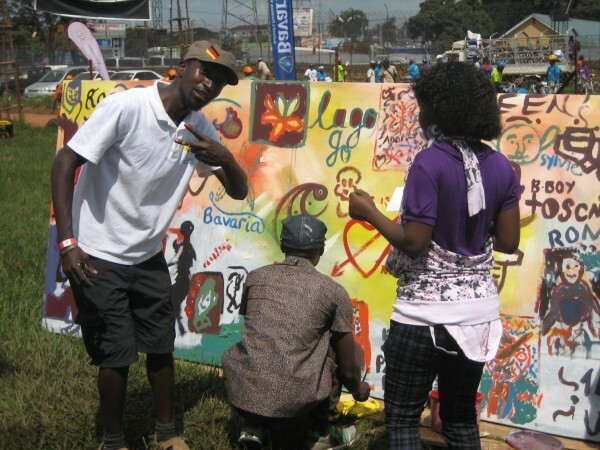 According to Eric Obonyo, a lanky and self-effacing young painter, This Is Uganda (TIU) is a festival about youthful expression in Uganda. It is a social network linking young people from different parts of the world through culture. He thinks that this year’s festival was better than last year’s, but doesn’t say why. Although he points out some of the benefits that he and his pals have harvested from TIU. He confesses that the forum has helped upcoming artists by offering them a chance to interact. He also confides that during the festival he was able to take a break from painting portraits and dally around. It was during one of these that Eric met his friend Xubie – in whom he obviously had considerable vested interest at the time I found him teaching her to paint portraits. Who said artists lack inspiration? The music blaring in the speakers was as inspiring to some, and so was the stream of exuberant visitors milling between the stalls. At the festival young people shared ideas, promoted their artistic merchandise (yes, that’s what it was) and learnt a thing or two about culture. Some artists came to see; such as myself who obviously was inspired to put pen to paper. 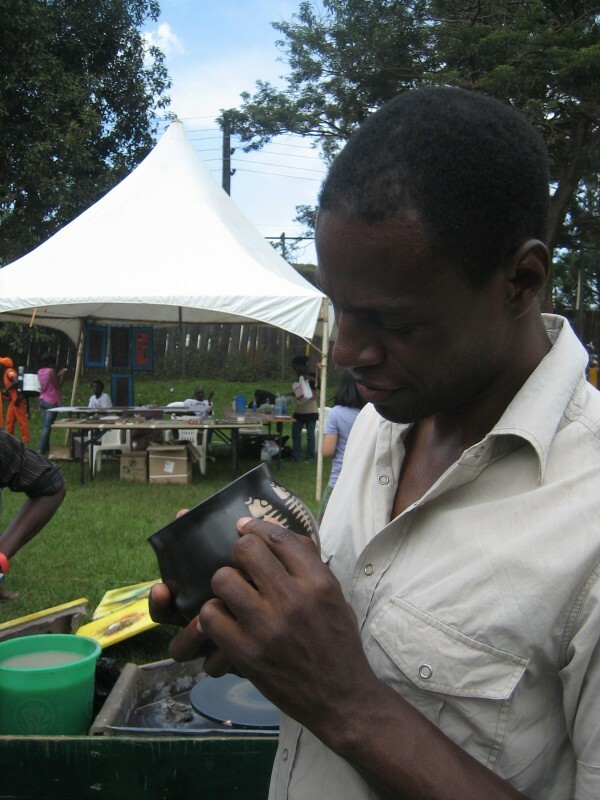 Others came to feel; Arnold Birungi, a water colorist renowned for painting wildlife and people sceneries, was feeling a smooth piece of pottery from the Makerere art school ceramics stall. But he came to buy and sell as well. 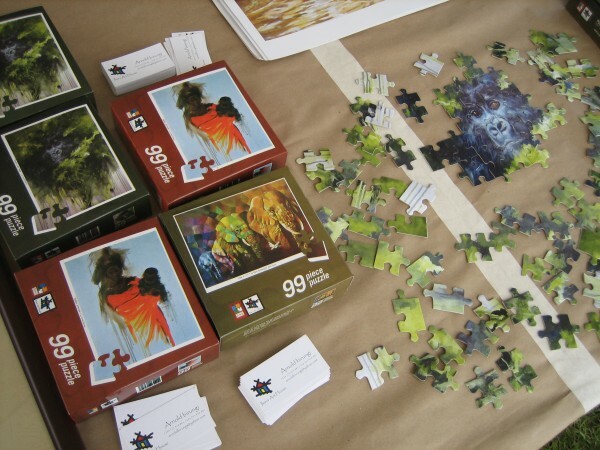 He had transformed his paintings into some complex jigsaw puzzles that were selling like hot cakes at the time I visited his stall. I bought myself a beautiful toppy from Wasswa Donald, another prominent artist (if you recall ‘I Speak Elephanish’). He too was selling; he had a stall of t-shirts, recycled shoes, caps and cards. The true Merchant of Venice, Bruno Ruganzu, on the other hand came to show off; he is an environmentalist (eco-artist). He chose the massive stage erected for the musicians as his exhibiting space and installed three gigantic shiny letters spelling TIU as backdrops. He told me he had gathered used CDs from Iguana bar and other private sources to make this impressive art installation. He had also created a ‘gateway’ at the entrance to the venue. It was interesting this recycling thing. Anything could be used, bottle tops (Bruno wore these around his thick neck), mineral water bottles, sisal ropes, banana fibers, used CDs and so on. Bruno chose to call his art post-modernism, and it involved fusing the old with the new in a bid not to loose one’s identity. Then yonder I beheld ‘Viva con Agua’. 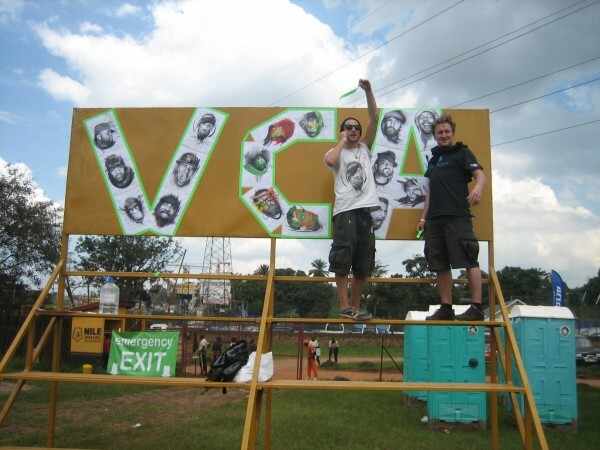 Michael Fritz and a friend were busy sticking some famous musicians’ faces with green tape on a yellow background to spell the letters VCA. Awesome art it was! There is a simple art project with global consequences. They make art in public spaces to raise money for the disadvantaged. How noble! Like Bob Geldof’s Live Aid concerts if you ask me. They sell the art and give the money to Welthungerhilfe which in turn avails water for the waterless. They are currently collecting money to provide fresh water for Lira, a district in northern Uganda. According to Mr. Fritz, VCA does live concerts and other fundraising activities to raise money for the less privileged. They have managed to raise money that has helped over 130, 000 people to access fresh water. Who said art can’t make a difference? But quite often brilliant ideas like these require loads of money to implement. Otherwise, why is it always the Hornsleths or Fritz’ – or whichever other European – that is capable of making such impactful art? 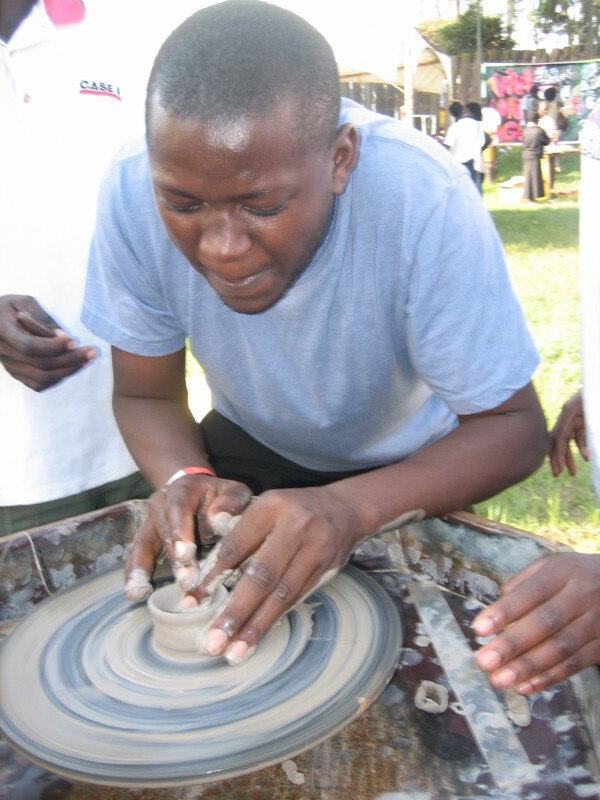 There was this student from Makerere art school who had dragged his potter’s wheel to the festival and was showing people how to spin a pot or two. While this seemed very interesting to watch, I was left wondering as to what educational or monetary value his efforts would accrue. 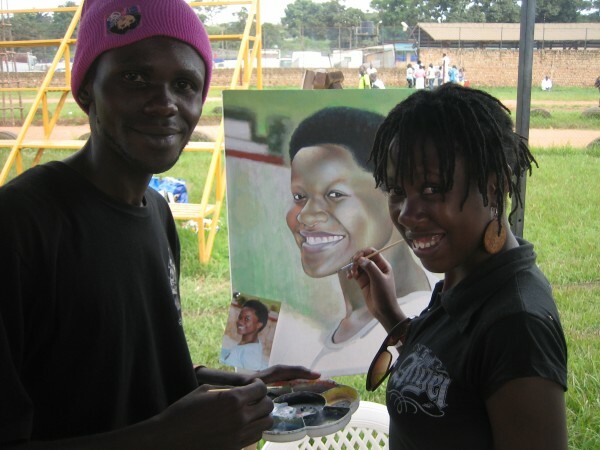 The problem with most Ugandan artists is that they get embroiled in technique and process that they forget to communicate ideas. In my view most artists at the festival weren’t saying a thing. This was the demise of Rolands Tibirusya’s live painting by the entrance into the festival venue. He had set up a canvas and allowed the willing to splash or scribble something on it. He let them scribble their sentiments about TIU using brilliant paints on canvas, but in my view not everyone can use the visual language effectively. Birutsya, as an expert, needed to step in and articulate their messages. Papa Shabani’s graffiti project suffered a similar blow; too many cooks spoiling the broth. There was this groupie of girls with their skimpy swag hesitantly spraying a whiff of colour here and there onto the poor chap’s canvas, ruining his already mediocre efforts. One of the girls, who were obviously mesmerized by Papa’s afro hairdo, upon dripping a few puffs of yellow on the canvas turned and aimed an ear piercing squeal in his direction seeking approval. Of course he indulged her with an encouraging smile. What a great forum for youths to interact indeed! 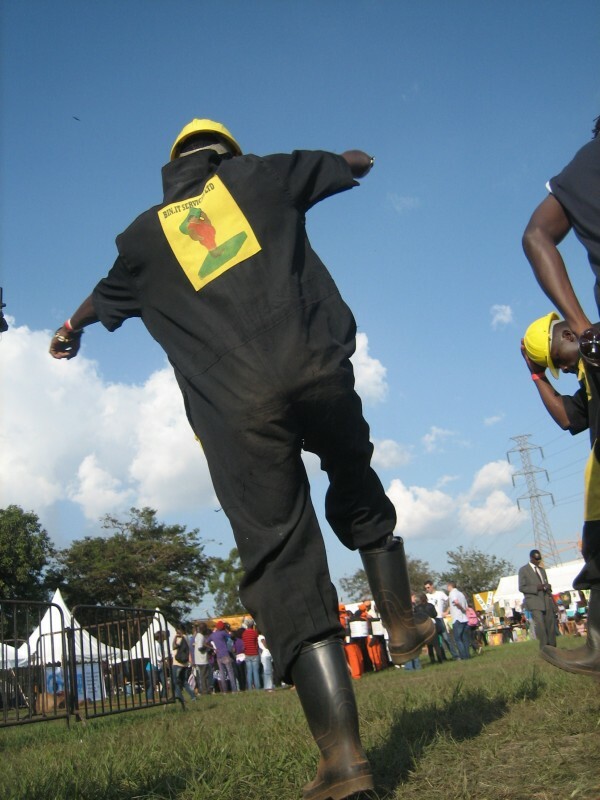 I could not help but notice a couple of lads in helmets, overalls with the bold label ‘BIN IT’ and gumboots jamming away to some reggae beats near the stage. They made working for a waste management company fun. I thought their act fitted in well into the visual theatre genre of art. Their stuff also made great material for photography. I too fell pray to the colonial mentality of isolating the crafts from the art. Whereas there were numerous stalls selling African fabrics, carvings and trinkets at the TIU festival, they did not catch my eye as anything other than stalls selling paraphernalia for tourists. Poor festival organizers. Or is it poor crafts merchants? 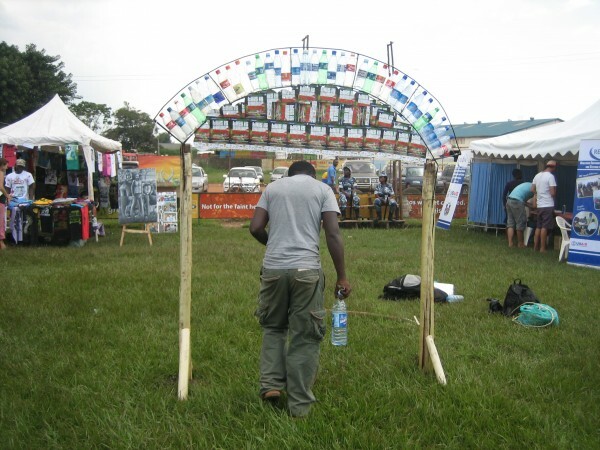 Surprisingly, these crafts stalls form the bulk of transactions at any festival in Uganda, from LaBa! to Bayimba. Patient ladies sit at their stalls waiting for mainly muzungu (white people) to buy an African gift for their loved ones back home. They even have a whole village at the National Theatre and on Buganda road in Kampala. The nature of their merchandise is mass-produced carvings, fabrics, jewelry and other utilitarian items. Some of these items have a distinct mark of a creative mind. This brings to mind the discussion I had recently concerning value and ownership in art during the recently concluded East African Art Summit in Nairobi. At the summit we discussed the new cartoon developed for BBC from the Tingatinga art of Tanzania by some Kenyan moviemakers. Our friends from Bongoland (Tanzania) were lamenting that the family of the late Edward Saidi Tingatinga (purported originator of the Tingatinga style) were starving while his creation was being ‘plagiarized’ by foreigners. The question is who owns the copyrights to all these great innovations such as the soapstone animals from Kisi or the animal carvings from the Kamba of Kenya? What about the puppet riding the wire bike? Whose intellectual property is this? I think the Ancient Egyptian artists were wise when they started signing their artwork. Maybe we too should own our products by scribbling a name on them to avoid future copyright wrangles. Kazuri and Mzuri have already claimed ownership of some brands of beads. Sadly they are owned by some Mzungu. I also know of a certain paper bead developed by Uganda’s master jeweller Sanaa Gateja from glossy magazine paper now being plagiarized by some hotshot artists in New York as their creation. Oh the robbery! Henry Mzili Mujunga is an eclectic artist who enjoys painting, printmaking, and conceptual art. His art has been exhibited extensively throughout Africa, Asia, and Europe. 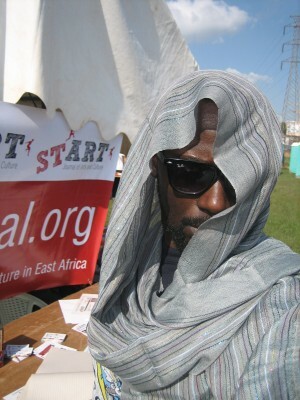 He is the co-founder of the Kampala Arts Trust and the Start Journal of Arts and Culture. All photos by Henry Mzili Mujunga. Also ….FIND ME ON FACEBOOK obonyo.eric@yahoo.com, THIS IS UGANDA & THE WAY WE DO IT.THIS PAGE Is A LOT TO MAKE ME POPULAR EVERY WHERE & other young upcoming artist…the power that makes us put in all our time for ideas some one out there is waiting for. see you again when i got good creativity for your eyes.